‘Straight Outta Compton’ is one of the best musical biopics of recent times, fully encapsulating the hype and impact N.W.A. had when they first appeared on the scene in the late 80s. Director F. Gary Gray does an excellent job of linking the collective’s lyrics to the band’s real life experiences as black youths in the powderkeg environment of California at the time, and the film’s narrative strongly depicts the righteous anger that fuelled the music and subsequently how this helped the band become as popular as they were. 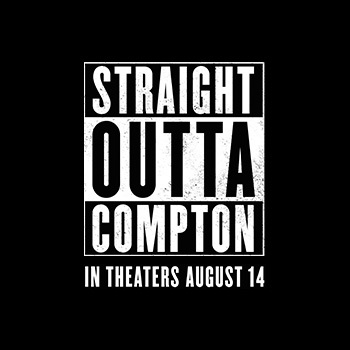 The film splits its time mainly between the character arcs of Dr. Dre (Corey Hawkins), Ice Cube (O’Shea Jackson Jr – Ice Cube’s real life son) and Eazy-E (Jason Mitchell), with less time devoted to MC Ren and DJ Yella. Whilst there’s a little sugarcoating involved in avoiding some of the character’s controversies with homophobia and their treatment of women, the film is fairly candid about the exploits of the band for a film produced by the key players. The film begins shortly before the collective came together, showcasing the environment the characters grew up in on the streets of Compton, providing a solid backdrop to the music the band would make and a contrast to the lifestyle they’d lead once they’d became famous and started making money. One of the reasons the film works so well is due to the chemistry between the core cast, with a solid rapport built up between the main actors and a lot of humour throughout their interactions. Out of the core cast, Jason Mitchell is the standout as Eazy-E, excelling at bringing this complicated character to life. This is true for both his portrayal of the younger E, the joker of the group who doesn’t quite fancy himself as a rapper, and even moreso in the later scenes where he confronts their manager Jerry (Paul Giamatti) and when he discovers he’s contracted AIDS. An actor with a limited resume at this stage in his career, I expect big things from Mitchell further down the line. For the second time this summer, Paul Giamatti plays a controlling music manager after his turn in the Beach Boys biopic, ‘Love & Mercy’ and he brings a bit of gravitas to proceedings around the young cast. The music throughout is terrific and is used well to compliment the action, with the film at its strongest when the songs are at the forefront of proceedings. There’s an undercurrent of anger to the early moments in the film and Gray does a good job of setting the scene for the motivation behind the collective’s songs and lyrics, which resonates just as powerfully today given recent high profile cases of police brutality in the news in the US. The film also delves into the business side of the music industry and how their manager screwed them over, and the impact this had on the relationships between the band members. Once the film moves into the later stages, it loses some of the energy that fuelled the narrative as it becomes overly sentimental about the fate of Eazy-E, but for the most part, ‘Straight Outta Compton’ is a hugely entertaining biopic of a band that changed the musical landscape of the time.